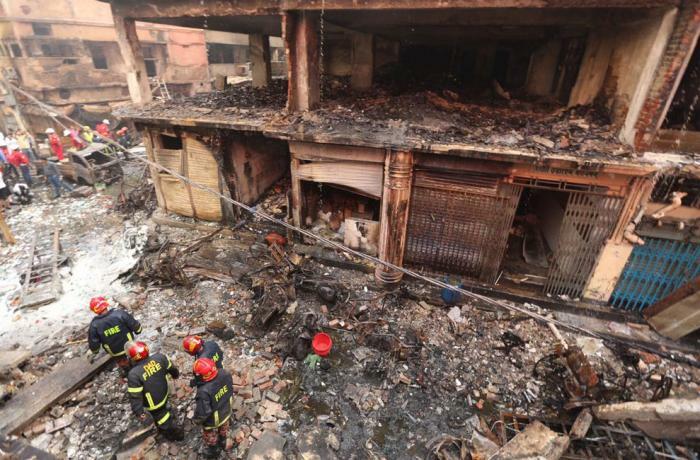 Dhaka, 70 dead blaze at chemical warehouse by Sumon Corraya The flames broke out in the area of ​​Chawkbazar overnight, the historic district of the capital. The area is packed with shops and perfume factories. In 2010, the authorities banned warehouses. Dhaka (AsiaNews) - At least 70 confirmed dead and 41 wounded: this is the toll from a fire that broke out overnight in the Chawkbazar area, in Dhaka. Although the causes of the fire are still to be ascertained, an editorial in the local newspaper The Daily Star already speaks of "pre-announced disaster": the flames spread from the ground floor of a building used as a warehouse for highly flammable chemicals. At the scene of the accident, besides the bitter smell of charred remains, there is a heavy smell of perfume. Speaking to AsiaNews, Shydul Hossian, owner of a destroyed shop, said: "At the time of the fire I was not in the shop. I heard people screaming 'Fire, fire' and I rushed. Everything was on fire. One of my employees is missing. I do not know what happened to him. " The flames broke out around 10:30 pm last night. It took 37 firefighting teams to put it out around 3am this morning and they are still searching for missing people. The bodies of the victims were transported to Dhaka Medical College Hospital. Relatives are gathering in the hospital area, but for now the authorities do not allow them to see the dead. Families are desperate and cry for pain. Dalwar Hossain reports that his brother died in the flames. "He worked in a shop in Chawkbazar. We are waiting to see the body of my beloved brother ". Chawkbazar is a historic district of the capital, in the Old Dhaka area. The area is packed with shops, factories and warehouses, mainly used to store the chemical components used in the cosmetics industry, which is flourishing here. Although in 2010 the authorities banned warehouses such as the one that went up in flames, poor controls and poor regulation facilitate accidents. The most serious is that occurred at the Rana Plaza complex in 2013, in which a fire and the subsequent collapse of the building caused the death of over 1,300 people.